Rick Neuheisel has been hired as UCLA’s head football coach. Rick Neuheisel is coming back to UCLA — this time as head coach. Neuheisel, who quarterbacked the Bruins to victory in the 1984 Rose Bowl and later served as an assistant under Terry Donahue, was hired Saturday as his alma mater’s 16th coach. The 46-year-old Neuheisel succeeds Karl Dorrell, who was fired Dec. 3 after five seasons on the job. 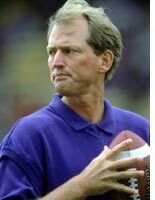 Neuheisel spent the last three seasons as an assistant coach for the NFL’s Baltimore Ravens, who finish the season Sunday against Pittsburgh. He served as quarterbacks coach in 2005-06, and was promoted to offensive coordinator last January. He had a 66-30 record as a head coach at Colorado from 1995-98 and Washington from 1999-2002. He hasn’t been in the college game since Washington fired him in 2003 for participating in a betting pool on the NCAA basketball tournament. He sued for wrongful termination from Washington and settled in March 2005 with UW and the NCAA for $4.5 million. A great hire. He’s had some problems, to be sure, but he’s a superb college coach. And I suspect he’ll be less anxious to leave UCLA, not only his alma mater but a storied program in a great city, than his previous stops.